US Vice President Joe Biden's bleeped out comment to President Obama yesterday once again reminded me of the crassness of the dialog in the world these days. Interesting how I have not heard anyone rebuke the Vice President. I am not saying that someone cannot use this kind of swearing in private.. not that I think it is a good idea.. but really.. can't keep a lid on it before a national audience? Give me a break! 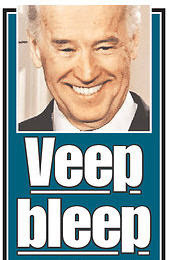 Biden has an obvious problem controlling his tongue. I personally don't like this type of language, even in private. But, grown men... what are you gonna do? I have to imagine Obama gets severely annoyed with Biden on a regular basis. I think some degree of honorable behavior should accompany an honorable office, and that would include appropriate language. I find it quite ironic that on Ash Wednesday, he stood before the world with ash on his forehead, signifying a life dedicated to Christ. Biden need to either walk the walk or forget the ashes. I agree with Warren... if you hold an honorable position...that should include honorable language. I can swear like a sailor and sometimes do, but you'll never hear it unless I know you are comfortable with it. 1) It was not directed at others nor was it down-putting. 2) It could in no way be confused with scatological or sexual humor/acts. 3) It did not profane a religion. 4) It was short duration. 5) It was uttered at a time of excitement and high emotion. Not a bad list Argon. I found the public nature of his comment to be offensive.. if it wasn't public they would not have had to bleep it out. Would a teacher's 'bleep' in a classroom pass your criteria? Oh, consistent with the general conditions I described, I think it would get a pass for a teacher too, provided they eventually followed it with an apology. I guess I'm just not terribly sensitive to the causal, infrequent, blue word that's not used in anger or intentionally meant to provoke or offend. Maybe this arose from listening to George Carlin records a lot. @Argon - Gotta agree with an apology. Seems like we got the opposite from the White House when the press secretary twittered "And yes Mr. Vice President, you're right ..."
Considering the enormous volume of bigoted and threatening rhetoric that is spewing from conservative leaders and the far right fringe that they pretend to represent, I am greatly disappointed that you found it necessary only to pick on a whispered comment that you were not expected to hear and only heard because the media amplified it.